Comrade Court: in the USSR an elected public body called upon to actively promote the education of citizens in the spirit of a communist attitude to work, to socialist property, the observance of the rules of socialist community life, respect for the honor and dignity of citizens. The main direction of the work of CC - prevention of offenses and misdemeanors, that harm society, by education, persuasion and social influence. CC can be created at enterprises, institutions, organizations, educational institutions (by decision of the general meeting of the collective of workers, students), in collective farms, houses served by house management or united by street committees, and in rural settlements (by decision of the general meeting of collective farmers , residents of the house, villagers, with the consent of the respective executive committees of the Soviets of Workers' Deputies). Underperformance at work, being frequently late for work etc. Lodging a request to leave USSR permanently for some foreign location, worse of all - a capitalist state or, deity forbid, the Zionist entity. Of course, the list of people "elected" to serve as members of the CC was approved by the management of the organization or the local party committee, but is wasn't necessarily a permanent appointment, usually an ad hoc selection. Since most (but by no means all) sessions of the CC must have been carefully orchestrated, the session was usually preceded by a hearing. This meant that the guilty subject was summoned to a meeting with one or several senior employees of his organization, in some delicate (meaning political) cases joined by an outside (party or KGB, depending on importance) representative. It was very important to the powers that be to establish not only the guilt of the subject, but also his/her potential for disruptive and provocative behavior during the public session of CC. Potential troublemakers are not only bad for the organization's image, they are dangerous for the public moral. The mere possibility of such characters gaining even smallest public expression of support among their comrades, present at the CC session, was mightily feared by the organizers. The "hearing" by itself was designed as a kind of preliminary punishment. Taking hours sometimes, it consisted mainly of a long and exhausting variety of probing questions, many having nothing to do with the specific offense, caused (or allegedly caused) by the subject. If behavior of the subject during the hearing wasn't satisfactory, the big cheeses present were peppering the questioning by direct or indirect threats - such as sacking, transfer to a low paying job, jail time etc. If the case was political and the subject was being stubborn and/or provocative, the case could have been transferred to the "higher authority", with the blessing of that KGB/party member present in the meeting. But of course, alcoholics, thieves, wife beaters and similar were dealt with quickly in most cases. Eventually, if a person was deemed by the powers that be fit to stand a public CC trial, the employees were summoned to the public meeting, where the members of the CC and the defendant took the places of honor (see the picture). Of course, one of the prerequisites for this gathering was careful selection and preparation of volunteers (yep, don't be surprised by that oxymoron) that were schooled and assigned to raise their arms and come up with some short text fitting the occasion. The defendant was given an opportunity to speak, the expectation was for a sincere (depending on the subject's acting ability) repentance. The subject, in most cases an inarticulate victim of the circumstances, mumbled a few expected sentences and benignly allowed to stand down. Then the sentence of the CC - a petition to the management actually - for a fine, a temporary demotion, a record in the personal file etc, was proposed and duly voted "yes" by 100% of the public present (not that anyone counted usually). Not infrequently, apolitical cases were enlivened by some unintended hilarity, when the questions addressed to the defendant got an unexpected funny result (what can I do, she slipped on the wet floor several times and these bruises, you know how it is...). A warm and fuzzy feeling was enveloping all present at the end of the session, and the accused was not infrequently patted on the shoulder: just don't do it anymore, buddy, although we all understand and know how it goes. Not so with the "political" offenses. The atmosphere in the room was tense. People were usually quiet, the wooden expressions on the faces of CC members stressing the seriousness of the situation. 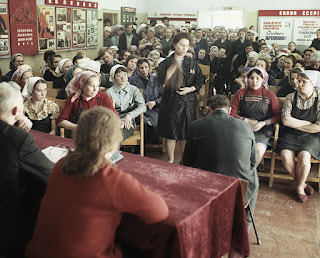 In many cases the proceedings started with a senior member of CC giving a speech about the "international situation", about the latest capitalists' nefarious anti-Soviet intrigues, about the Zionists' latest aggression, about Soviet Union being the shining lighthouse and beacon to the progressive elements elsewhere in... etc. Then the litany of imperialist cowardly misdeeds seamlessly entered the current case - the obvious rudiment of the bourgeois (feudal... etc.) past that sits here before you, comrades, his/her misdeeds begging for punishment. How could our healthy body have caught this inexplicable disease, comrades? What have we hitherto missed? The critical moment usually came when the CC master of ceremonies called for the offender to speak. Even after the vetting by the previously described "hearing" committee, politically correct behavior of the defendant was not totally guaranteed, of course. There was a certain element of risk. A cautious defendant, minding his future, usually got over this part with a few mumbled sentences of repentance and apologies of some non-binding nature. As expected by all present. If, however, in spite of all the precautions and threats, the offender went into a defiant counterattack, the situation quickly deteriorated. Such behavior endangered not just the defendant, it stained the lily white record of the people that prepared that meeting and (especially) the people who have been present at the hearing. One of the hearing's goal was to make sure that such eventuality was prevented, after all. 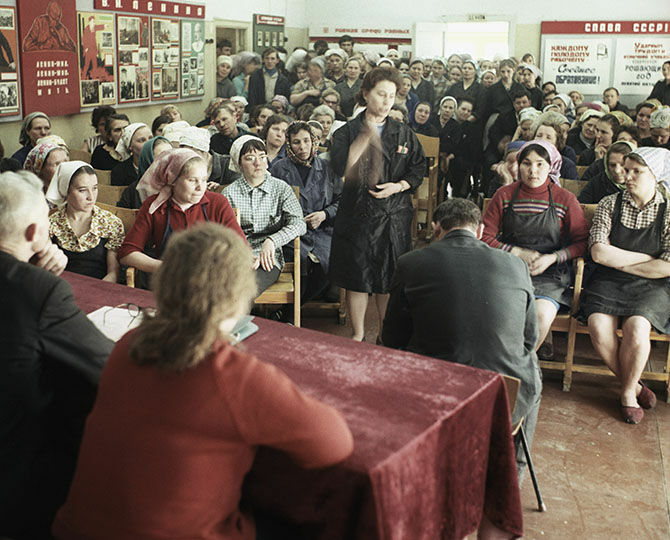 The crowd present, of course, might have started booing and protesting the "anti-Soviet" outburst, but if a friend or two of the defendant, of more fearless nature, were present, expressions of support weren't totally unknown to happen. Havoc sometimes ensued, and the only remaining way for the august committee was to quickly declare the session aborted and done with. Usually in such case the punishment of the miscreant was stiffened. In one specific case of my buddy who was accused of anti-socialist behavior and views, his uppity behavior during the CC session caused a criminal charge being concocted against him later, ending in a criminal court* hearing and subsequent punishment. Still, on the average, with all the travesty of the public "trial" with a predicted result, with no defense lawyer and no law at all, the absurd ritual no one really believed in and no one really was excited about, was much better than falling into the hands of the criminal court or the KGB. Besides, as mentioned, these CC proceedings sometimes provided some much required hilarity. Thanks for the small favors in the continuous grey reality of permanent lie. (*) To remind you, there were no "political" cases or political prisoners, everything in USSR was filed under the Criminal Codex.